Today in Aomori (to the North of Japan) the World Championship in sumo wrestling has started. One third of the Russian team is made up by Tuvans. One of them Ayas Mongush has to prove on the sumo's motherland his world champio's title won last year in Brasil. Sainkho Namchylak (Tuva-Austria), Iva Bitova (Czech Republic) and Shelly Hirsh(USA)is performances have made up the final concert of the music festival "Deep larynx or dangerous vocal cords", which was held on October, 18-21 in Moscow. The Tuvan-Austrian singer presented to the public her new music programme "Vocal and mental equilibristics", which combines recitations on spiritual and everyday subjects with virtuous vocal technique including traditional Tuvan throat-singing in the untraditional female interpretation. 5 cows perished of anthrax in the village of Moren (in the south-east of Tuva). The spokesman for the chief sanitarian body of the republic points out that the infection was not brought into Tuva ftom outside but comes out of the old cattle burial mounds from the 50-ties. Chylgychy Ondar, the vice prime-minister of the republic, has become a new deputy for Tuva in the Federal Parliament. He took the lead in the State Duma elections, held in Tuva on October, 14 winning all in all 38 per cents votes out of those who came to the poll on the election day.His runner-up Sergei Mongush, minister of internal affairs, gathered 36 per cents votes, the other 3 candidates for the deputy fell far behind: Victor Norby, Moscow banker, came with 13,8 %; Alexandr Kashin, mayor of Kyzyl - 4,1%; Vladimir Tavberidze, leader of the Tuvan affiliate of the All-Russian political party "Apple" - 1,2%. The weekly direct flight Moscow-Kyzyl-Moscow, resumed in August, has proved to be the most reliable and quickest way of communication between the two capitals. The AST-Air company who rent the plane, presented to Tuva by Boris Yeltsin in 1995, makes a regular inquiry among flight passengers asking for their recommendations as for the desirable date, time and commodities aboard. The latest poll shows that Sunday is the best time for the flight. The Budget Committee of the Supreme Khural (Parliament) of Tuva has considered and discussed at its session the implementation of the republican budget for the 1st half of this year. The half a year profits of Tuva state at 171,1 billion roubles out of which its own profits make up 53,1 billion. The proper Tuvan income makes 3 % out of the whole budget of the republic (in 2000 - 3,5 %). The rest of the Tuvan budget comes from Moscow. 60 more students from Tuva came to Moscow this year. Today the 1st year students took a solemn students oath. 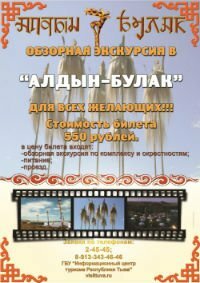 This is the first time when the Council of Tuvan community in Moscow organizes such a ceremony for the Tuvan newcomers to higher institutions of Moscow.